Champion jumps trainer Nicky Henderson appears to be going all out to land his first ever victory in the Crabbie’s Grand National and is set to saddle four runners in the showcase event, including this year’s Hennessy Gold Cup hero Triolo D’Alene who has already tasted victory over the awesome spruce fences, writes Elliot Slater. Henderson has gone close to winning the race on a number of occasions since the early 1980’s but the highest profile race in the sport has always alluded his grasp. This year, as well as current 20/1 shot Triolo D’Alene, the Seven Barrows handler is set to run the former Cheltenham Gold Cup winner Long Run (14/1) (pictured), the classy Hunt Ball (66/1), and the stayer Shakalakaboomboom (33/1), ninth in the 2012 renewal behind Neptune Collonges. Of the Henderson quarter Triolo D’Alene is the one who has already learned how to win over the Aintree fences having announced himself as a potential Grand National winner when galloping to a memorable success in last year’s John Smith’s Topham Trophy over two-and-three-quarter-miles of the National course, staying-on bravely at the finish to deny Alan King’s useful Walkon by three-quarters-of-a-length. After finishing third in a hot Ascot handicap on his seasonal bow the gelded son of Epalo showed he is really going places with a brilliant victory in the Hennessy Gold Cup at Newbury in November where he stormed away from Rocky Creek to land a famous success. 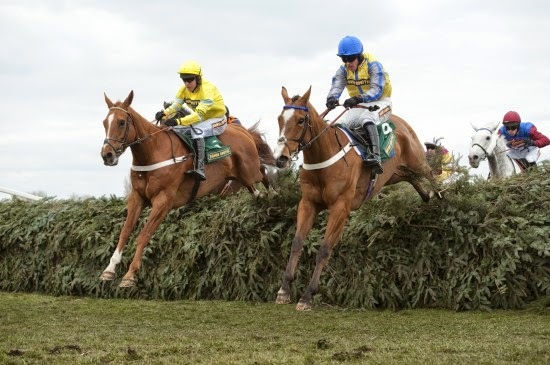 Ideally suited by decent ground, Triolo D’Alene didn’t race during the winter and reappeared in the Cheltenham Gold Cup last month where he was under pressure and beginning to fade when badly bumped at the second from home. With a view to the Grand National, jockey Tony McCoy didn’t punish his mount at Cheltenham once his chance had gone, a factor that could prove highly significant if the seven-year-old is in the firing line at the business end of Saturday’s £1 million contest.